UMX Ez-Adjustable Wrist Lanyards With Huge Selection Of In Stock Color Straps Available. 5/8" Plain color wrist lanyards with huge selection of hardware attachment and in stock color available. The heavy duty and high quality wrist straps come with black, red, white, royal blue, navy blue, burgundy, dark green, light green, pink, orange, yellow, purple, gray and teal color available. You can order custom PMS color of wrist strap for you special application too. You can add any listed heavy duty snaps or gate rings easily. They are all in stock, we can make it for you right away with any combination of hardware attachment, and custom length or color of straps. If you like put some personalized message or company logo on wrist straps, we have a great logo imprinting service with a super fast delivery available. You can buy our color straps by foot or by roll to make or design your own wrist lanyard easily. 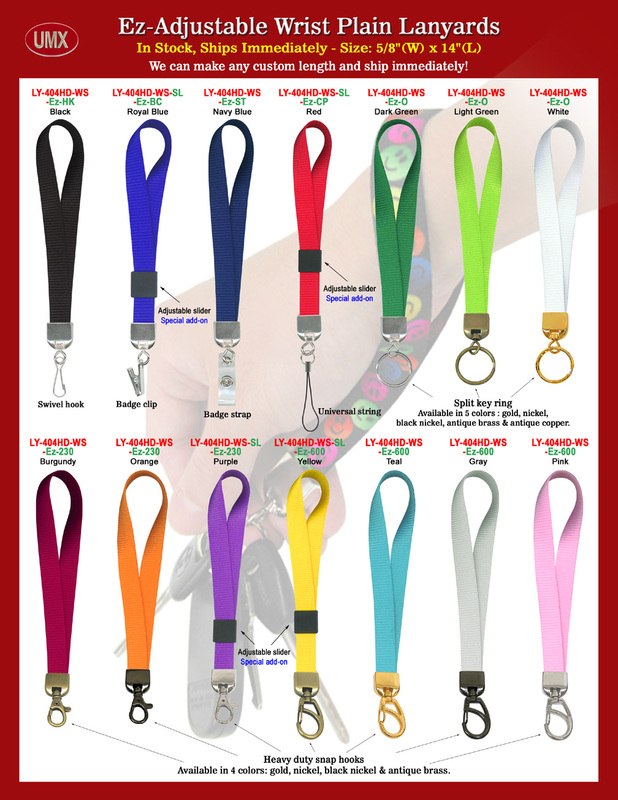 You are viewing Lanyards > Wrist > Ez-Adjustable Plain Color Wrist Lanyards With Huge Selection Of In Stock Colors and Hardware Attachments Available For Immediate Needs.